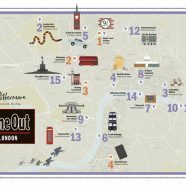 Time Out London, in conjunction with official Harry Potter portal Pottermore, created this lovely map showing 18 places in central London that have featured in the Harry Potter books and films. 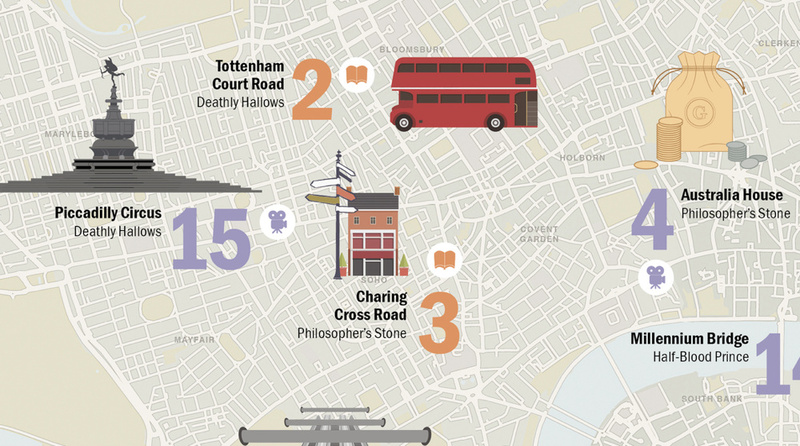 From Platform 9 3/4 at King’s Cross station, to the Knight Bus crossing Lambeth Bridge, the map allows you to construct your own Harry Potter themed tour of the capital. Filming locations are marked with a purple logo while book locations are in brown. 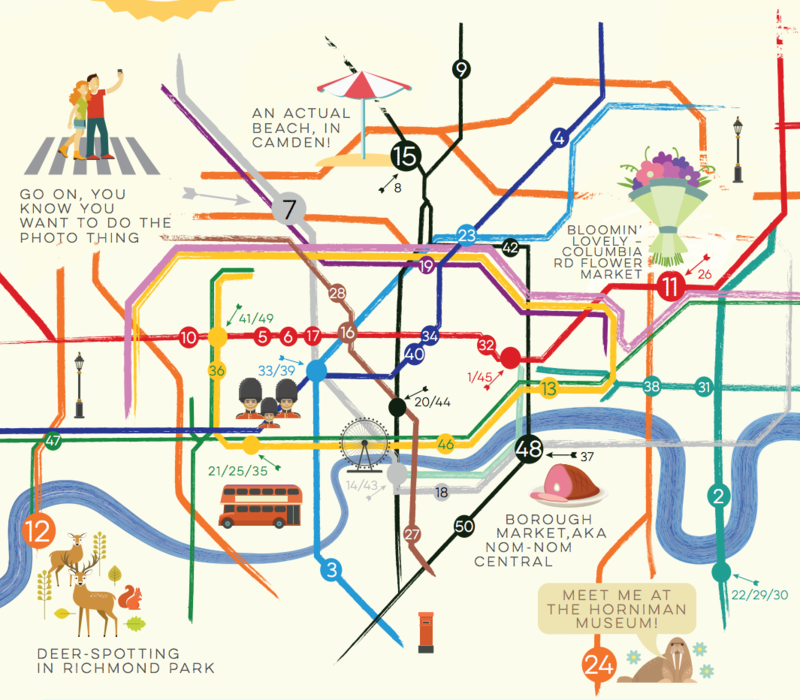 The places are overlaid on an attractive, muted map of central London streets, parks and the River Thames, the map being finished off with an attractive border and adornments that makes it so much more than just pins on a Google Map. If you are wondering why the Happy Potter studio tour (aka “Warner Bros Studio: The Making of Harry Potter”) is on this map, it’s not actually in central London, or indeed London at all, but is up near Watford, just beyond the suburbs of the city – trains from Euston Station will get you to Watford Junction in less than half an hour, followed by a shuttle bus that runs to the studios from there. The other key London-related Harry Potter attraction is the location of the West End play Harry Potter And The Cursed Child. This is at the brown No. 3 “Charing Cross Road” on the map. Both the play and the studio tour are very hard to get tickets for, you need to book a long way in advance. The best walk-in Harry Potter experience in London is without doubt Platform 93/4, where there is an embedded luggage trolley where you can pose for free for photographs, and a rather unusual shop right next door. See the full size map and detail here. 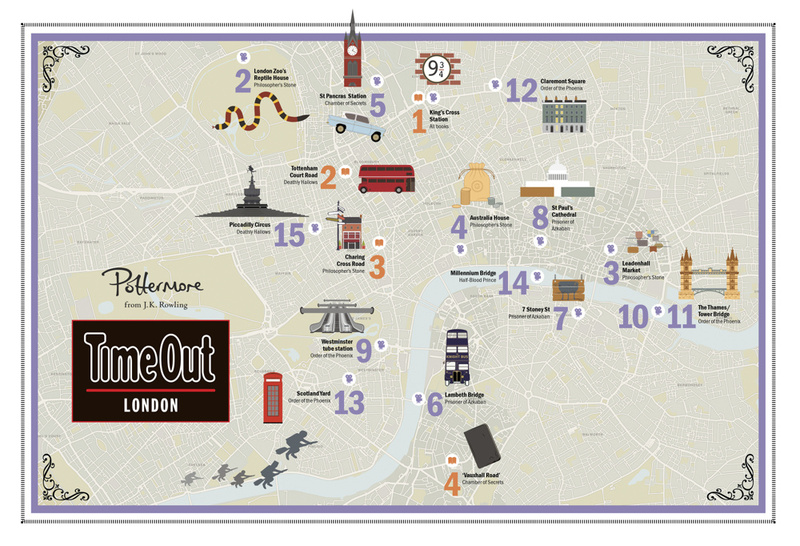 Copyright Pottermore with Time Out London.